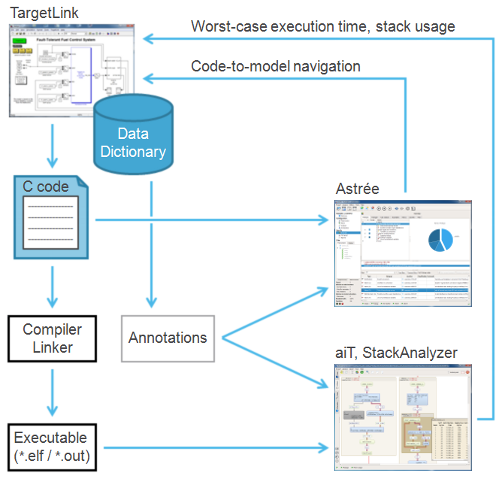 aiT supports tight integration with TargetLink, the production-code generation tool from dSPACE. TargetLink automatically generates production code for graphically specified functions straight from MathWorks MATLAB/Simulink/Stateflow. This drastically shortens coding and development time and contributes to a consider­able improvement in the quality of the pro­duction code. The automated flow between TargetLink and AbsInt’s tools provides for a seamless integration into the de­velopment cycle. AbsInt and dSPACE cooperated on the integration in the TIMMO-2-USE project that addressed the specification, transition and exchange of relevant timing information through­out different steps of the AUTOSAR-based development process and tool chain. The worst-case execution time of each TargetLink root function, its maximum stack usage, and alarms about possible runtime errors can now be viewed directly in TargetLink. By making these implementation-level properties visible at the modeling level, you can detect errors and bugs early in the development process, avoiding late-stage integration problems. Static analyzers do not require the system under test to be executed on a hardware proto­type. Results are available quickly, no dedicated hardware is needed. The analyzers work on the generated code and provide full control and data coverage. This enables safe upper bounds on worst-case execution time and stack usage to be computed and the absence of runtime errors to be proven. The static analyses can be invoked automatically from the TargetLink GUI. This makes it easy to run an analysis after each model change, if desired. Navigating from the source code to the corresponding model component is possible with a single mouse click. 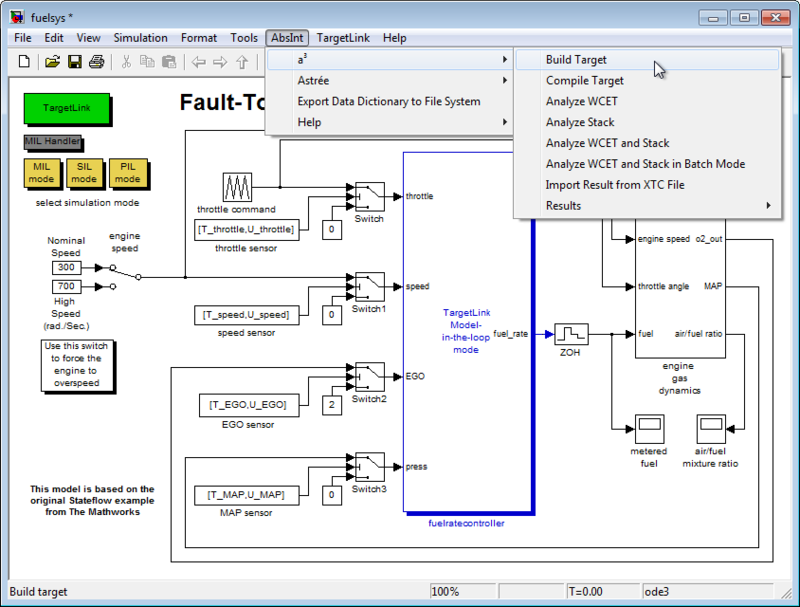 This simplifies alarm analysis and en­ables direct error tracing between implementation and model level. Relevant model-level information is automatically propagated to the analyzer to enable tighter analysis results and avoid double inputs. The worst-case execution times can also be integrated into the TargetLink model docu­mentation, or exported to an AUTOSAR authoring tool such as SystemDesk. The AUTOSAR system design can then be exported to system-level timing analysis tools like SymTA/S, to analyze response times and compute end-to-end latencies. 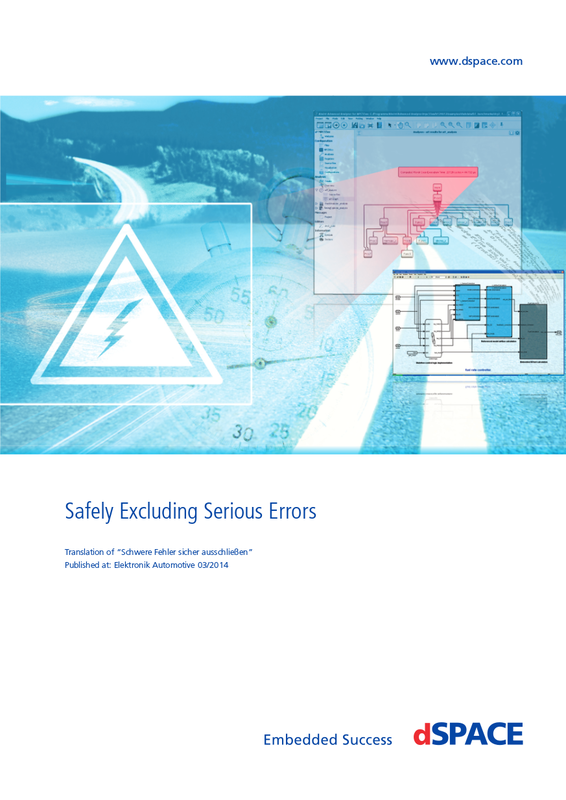 In-depth seven-page article (PDF, 2.5MB) published in Elektronik automotive. aiT, StackAnalyzer, and Astrée offer TargetLink integration straight out of the box. No additional packages need to be installed. All tools can be evaluated for free for a period of 30 days. Contact info@absint.com with any questions.